This beautiful and modern Dining Set is a fantastic addition to any modern home. 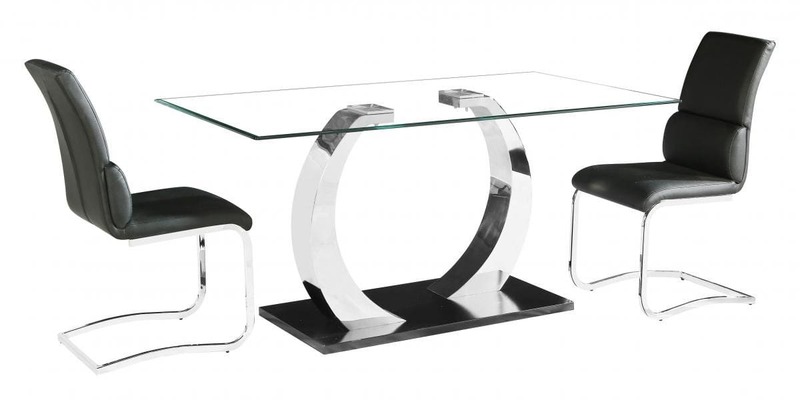 The Phoenix Glass DIning Table has a minimalist and modern design that has a simplistic beauty. The wide (1600mm) table top makes plenty of space for serving dinner. The Clear Glass design means you can see see the stunning frame underneath. The frame has two curved supports with chrome finish that just complement the modern style, and has a stainless steel base for support. The Dining Set also comes with six Dining Chairs. The flowing designs, with added back supports are beautiful and comfortable. The Black colour fits with the modern, stylish table design. Help up by curved chrome cantilever supports that have a very modern look. Get the perfect set for your home.